Where crime goes, superheroes follow to enact their own brand of justice. No place has a greater calling than Rook City, a hive of scum and villainy. Overwhelmed by corruption with the highest crime rate of any city in the world, Rook City needs your help. But just as heroes answer the call to arms, villains answer the call of glory and fame. Will your team vanquish their mighty enemies, or will you fall victim to their devious schemes? 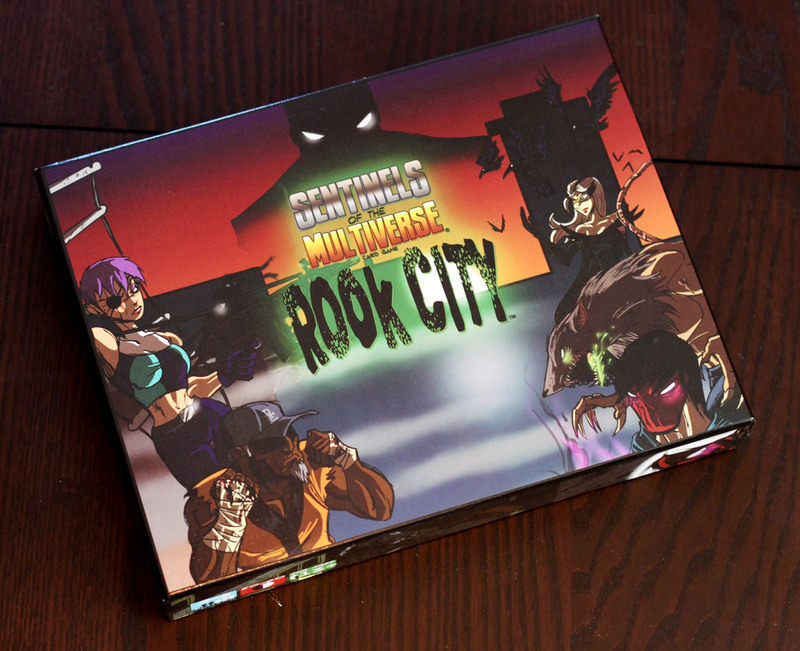 Rook City is an expansion to Sentinels of the Multiverse; if you haven’t checked that game out, I recommend heading to our review of the Enhanced Edition first, so you can get a handle on what’s going on. 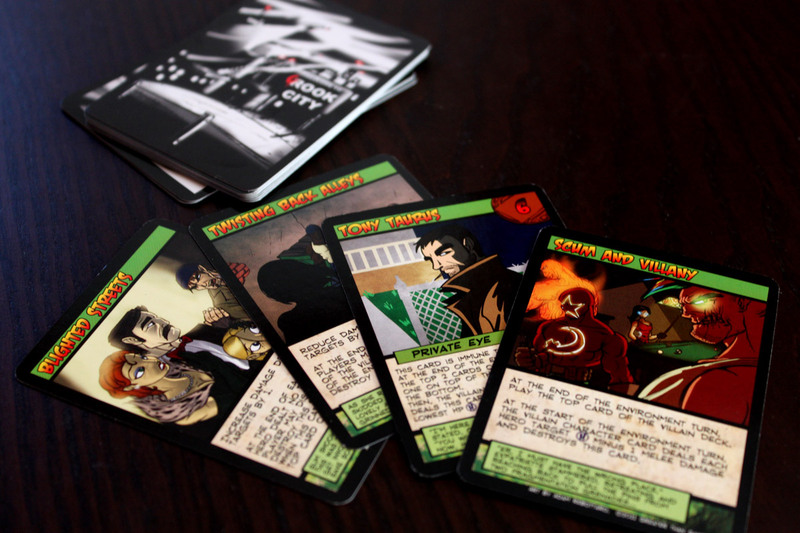 If you don’t feel like clicking that link, know this: Sentinels is a cooperative card game pitting superheroes against a supervillain. If you are familiar with Sentinels, Rook City brings a tidy package of 2 new heroes, 2 villains, and 4 new environments to serve as battle arenas. The heroes are Expatriette, a gun-toting assassin with skills and a wide array of ammunition, and Mr. Fixer, a mechanic equipped with tools and a hefty knowledge of martial arts. Villians include The Matriarch who mystically controls an army of crows, Plague Rat, a mutant borne of toxic chemicals, and the Chairman, who runs a powerful organization and is protected by a powerful Operative. You’ll fight battles in the old Pike Industrial Complex, and the titular Rook City itself. 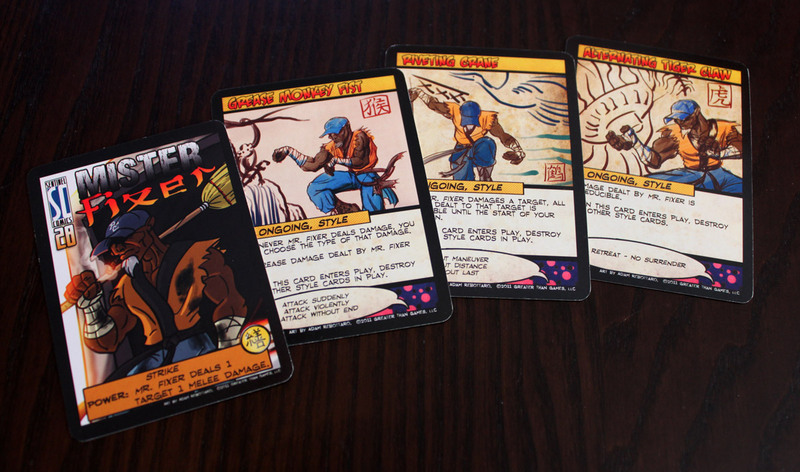 There are no major rules changes, although a few additional keywords are added – some cards are “indestructable,” some damage is “irreducible,” and some effects are scaled based on the number of players. Splinter: the Shocking True Story You’ve Never Heard! Can This City Be Saved? 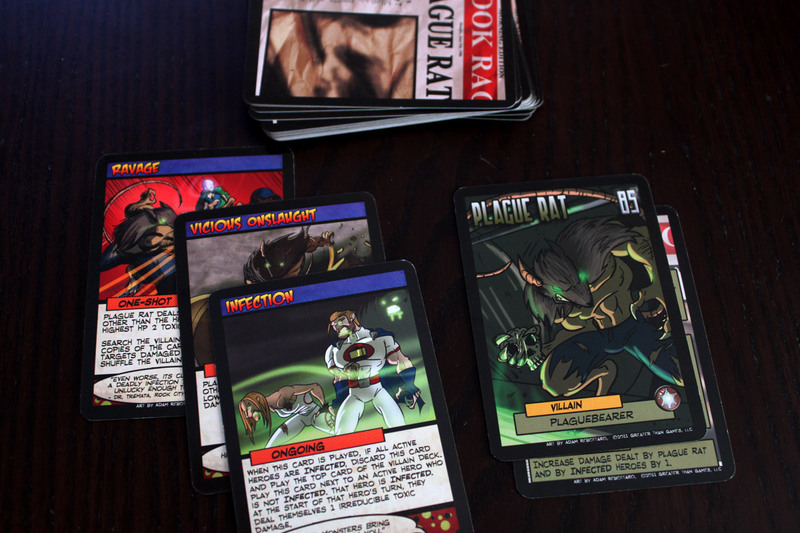 Games like Sentinels of the Multiverse are just ripe for expansion. A good chunk of the fun is exploring different combinations of heroes and their powers, and facing off against a myriad of villains. The second risk is of course “more of the same.” New superheroes to play are always well and good, but if an old hero is strong and fast and the new hero is fast and strong, you’re not adding much to the experience. The same is true for villains; if a villain in the new box plays the same as villains in the old box but uses birds instead of robots, the experience isn’t really new. Perhaps you’ll have fun in SPITE of yourself. Get it? Get it? The third risk, I suppose, is that the new heroes and villains are not stronger and not the same, but end up just being dull and lackluster. Fortunately, Rook City doesn’t fall prey to any of these. The heroes are fun, the villains are interesting, and the environments are… well, they’re environments. As the crow flies! That is, in massive, terrifying armies of doom! The new heroes don’t really solve the issues I had with the original game (really small issues, by the way; if you read my review of the Enhanced Edition, you should know that I really enjoy the game despite some its flaws). That is, your ability to contribute depends largely on drawing the right cards. 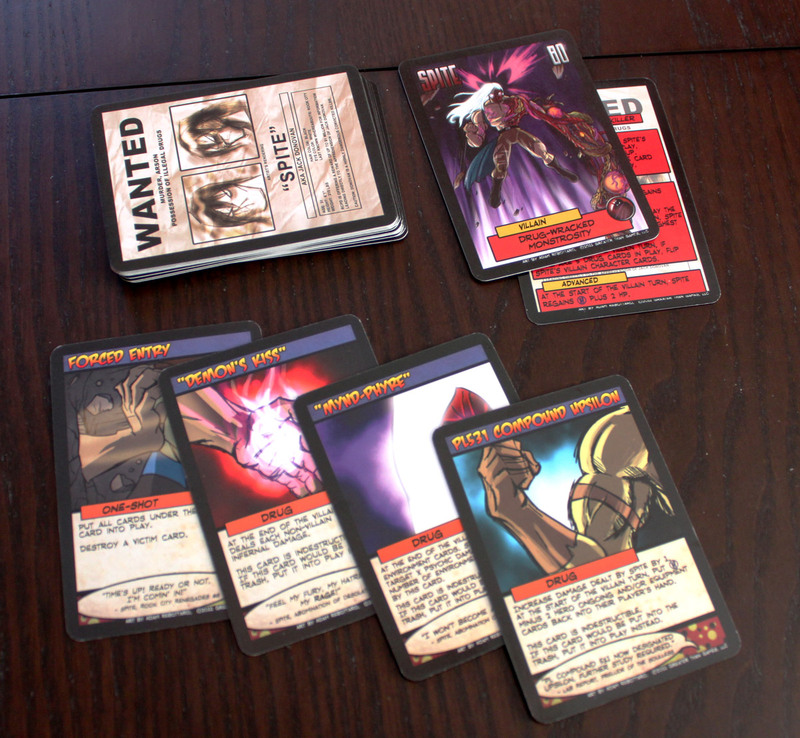 There are ways to mitigate the card draw issue – you can draw an extra card if you don’t use your powers or play a card – but they only go so far and generally result in essentially losing a few turns. Anyways, Expatriette in particular suffers from this. 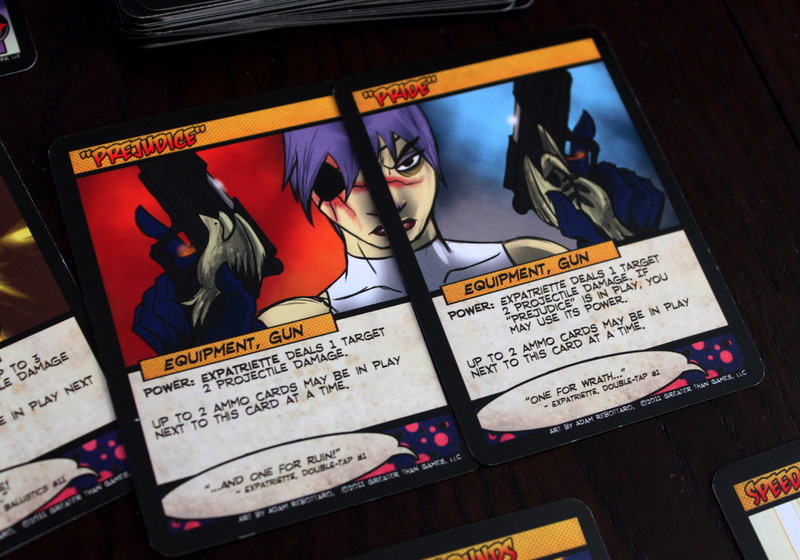 She uses guns AND ammo cards, and is most useful when you have both together. But sometimes you draw all her ammo cards and can’t fire them from anything; other times you draw all the guns but no ammo, so while you can at least attack, the attack power is pretty weak. But, there are some pretty sweet guns and pretty sweet ammo, and with patience, Expatriette can deliver a large stamped and sealed package of military grade death to a villain’s face. Yes, eventually you will get a combination of cards you can use, even if it’s not your best combination. In just about every game (using the Enhanced Edition), each hero gets to do SOMETHING pretty cool. The game is short enough that one awesome turn is enough to make the whole game exciting, because you’re building up to that moment. Most fortunately, the worst thing about the original game makes a grand no-show in this expansion. 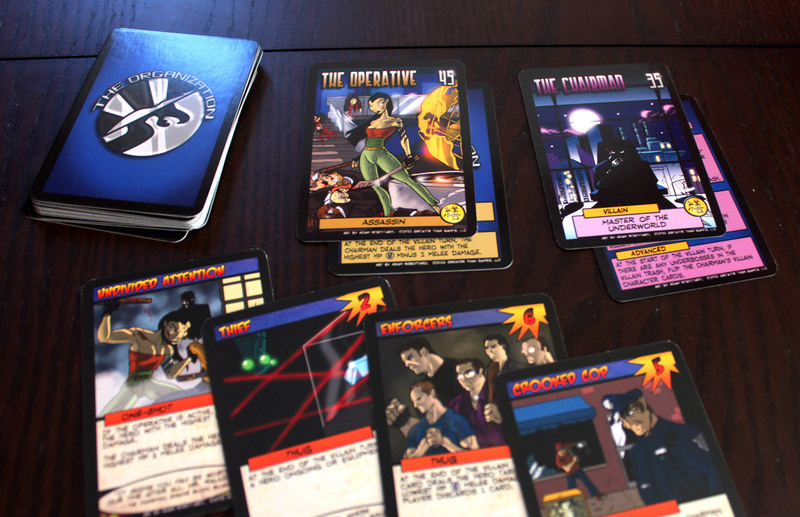 I’m referring to the environment and villain cards that wipe hero tableaus. Those are the worst. They aren’t extremely frequent but when you spend 5 or 6 turns building up your tableau of powers readying for that one awesome strike… and then suddenly everything you’ve earned gets dumped, that’s when the game is not awesome. (Unless, of course, you’re playing as Tachyon who is powerful with a large discard pile but… well… yeah). Anyways, none of the villains or environments wipe entire tableaus, and I only saw one effect that forced heroes to discard – but it also allowed the hero to take damage instead. That is a win, my friends, because that effect was the worst part of the base game, no matter how rare it was. For those of you who jumped in early to Sentinels and don’t have the Enhanced Edition, first of all, I’m sorry. Second of all, Rook City introduces many of the concepts that were re-introduced in the Enhanced Edition, primarily villain and environment attacks that scale based on the number of players, which makes for more balanced and fun games when you don’t have exactly 4. The inclusion of 4 new villains is pretty cool; new heroes add to the mix, but new villains let you retry previous hero combinations with an all new challenge, so it makes sense that they put more villains in the box. That impervious team you discovered against Baron Blade or Omnitron may not fair quite so well against the raven armies of the Matriarch. You won’t know until you try. 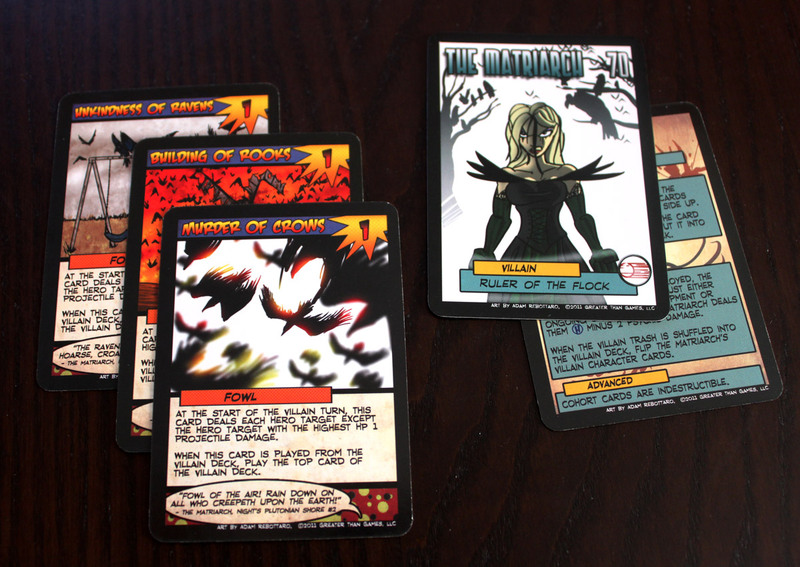 The villains are unique; Matriarch has a seemingly never-ending army of crows (weak but they…just…keep…coming). Plague rat does massive, infectious damage. You’ll just have to explore the other villains yourself. I feel pretty “meh” about the environments in general. 2 new environments is cool, but to me the environment deck overall seems like a missed opportunity. It most often acts like an additional villain to deal with, where it could have added more generic obstacles that could be turned against the villain if used creatively. But instead of adding more interesting choices, it just adds more damage. Still, you’ve got a couple more environments that do a few different things to spice up your superheroing life. We’ll need guns for this. Lots of guns. All of these words basically to say, Rook City is a great expansion. It doesn’t seal up all the cracks in the Sentinels armor, but it does take a step forward by eliminating forced card wipes, and the new heroes and villains are great fun to add to the mix. 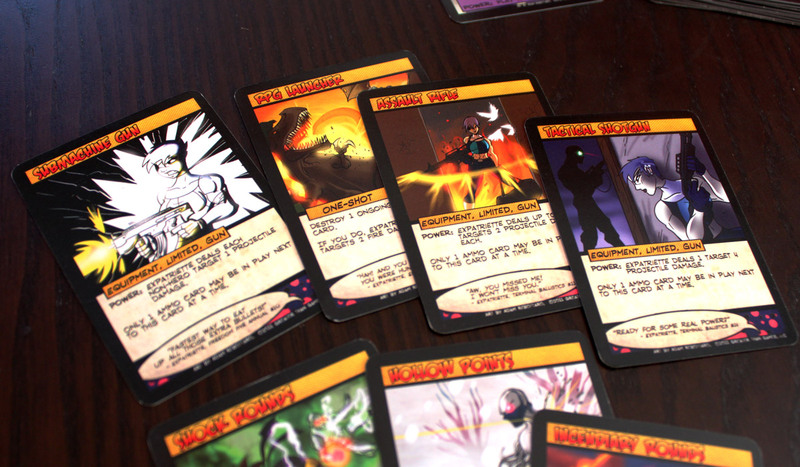 iSlaytheDragon would like to thank Greater Than Games for providing us with a review copy of Sentinels of the Multiverse: Rook City. Gone are effects that forcibly wipe out hero cards. Luck of the draw still has a significant effect on what each player can do. Whoops… apparently the timeline is being messed with!